ExxonMobil is the largest publicly-traded petroleum and gas company in the world. The company leads the industry in almost every aspect of the petrochemical business. With daily production of the equivalent of 4.18 million barrels of oil, Exxon Mobil is the largest of the six major oil companies. Exxon gasoline is sold at over 45,000 stations, in more than one hundred countries. If you usually fuel up your car at ExxonMobil gas stations, consider gasoline credit cards that can earn you cash rebates just by making fuel purchases. By using a gas rewards card at ExxonMobil locations, you can earn high cash back rebates on gas purchases. Apply online for a gas rebate card so you can enjoy generous rewards with the added convenience of being able to pay at the pump! 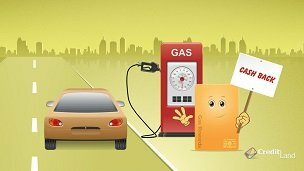 A gas rewards card is a great choice for those drivers who are looking to earn rebates whenever they purchase gas. With today's fluctuating gas prices, a good gas rebates card is essential for every savvy driver. All you need to do to earn rebates is use your card each time you fill your tank at a gas station. It has never been so easy to accumulate cash back rebates! By choosing a gas credit card that is accepted at all gas stations, you're likely to accumulate gas rebates faster and easier. Some gas rewards programs give high cash back rebates on everyday purchases, such as groceries and fast food, in addition to gas. By applying for these bank offers, you can earn even more, since they can be used at multiple locations. Also, they can give you additional rebates on the purchases you often make. Depending on the gas rewards program, gas rebates can be redeemed for free gas, gift certificates or merchandise, or they can be credited to your account at the end of each billing cycle. When choosing the right gasoline card, be sure to understand its terms and conditions, since some credit offers may have amount limitations or expiration dates on their rewards. I thought Exxon Mobil credit card will be good for me but it turned out that I cannot meet their 45 gallons requirement every month. So this card is useless for me. Now I m looking for the card that will reward me without any minimums. Can you recommend me one?